Here we are at “cold and flu” season again, something I rarely have to give much thought to, except for times like now when I am struggling to rid my system of a tenacious virus that’s been hanging on for several weeks. This reminds me of a few years ago when my sister and I had both been hit with a similar bug. Luckily, I began to feel better by resting more (seems I am more susceptible when I over-extend myself), gargling with saltwater, taking extra supplements, eating healthy foods, and drinking plenty of liquids. It appears that this time around something more is needed. But what? Around the same time my sister and I were battling our own viruses, I discovered that I had 15 viruses on my computer that had to be removed as well. The computer guy cleaned everything up, installed a program called Malwarebytes, and changed my old PC over to a new computer tower. 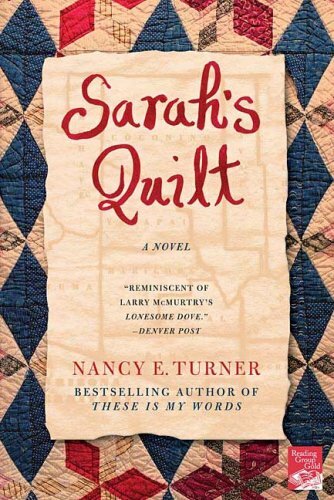 While the past virus thing was going on, I had been listening to the CD version of the novel Sarah’s Quilt, the continuing saga of Sarah Agnes Prine, by Nancy E. Turner while driving back and forth to work. I was uplifted by Turner’s wisdom and the nobleness of her character, Sarah Prine, who lived in uncertain and difficult times. The book showed how Sarah’s association with her wayward nephew Willie, who just showed up one day on their doorstep, caused her so much heartache and trouble and almost caused her to lose her ranch. But she transformed her hurt and anger into love for this wayward boy due to his own determination to come clean and make things right. She stood by him to the end, supporting him with her unfailing love and support when he was eventually jailed, tried, and hanged for horse thieving, cattle rustling, and murder. The author also showed how Sarah’s tender nature – although she was a woman of pioneering spirit and tough resilience who liked to present a tough and independent face to the world – almost got her killed by allowing a lunatic to roam free on her land who eventually tried to kill her. However, Sarah, led by her compassionate and courageous spirit, prevailed as a light in the world around her. Intrigue piled upon intrigue, as another character in the novel was secretly working to drive Sarah and another rancher off their land by doing things like poisoning her animal water trough and burning out his land and stock. This nefarious character went by the name Ernesto Maldonado. Sounds like the name of a bad virus, no?!. Sarah displayed intense anger almost to the point of shooting Maldanado whom she had mistakenly thought was an entrusted friend before finding out his true design to poison her well to drive her to ruin so she would marry him and combine their ranch lands. But in the end her compassionate nature won out again, and she let him live. Having been shown mercy, Maldanado made up the material loss he caused to both Sarah and the other rancher, but he and Sarah were never friends again. The meaning in the connected events for me is that there are many ways to bring life back into Balance. It takes a person’s whole vision, inner and outer, to watch for the things in life that “infect” her material, mental, and spiritual worlds. Healing comes in different ways, depending on the situation: Some healing calls for compassion and forgiveness (Willie did die for his crime, but he was healed spiritually by Sarah’s love); other events might call for a combination of sharp insight, elimination, forgiveness, and applying personal protection. Just as Malwarebytes cleaned up my computer viruses and gargling with salt, getting plenty of rest, taking extra supplements and eating healthy foods helped me to get well, it takes combined analytical and intuitive thinking (awareness of signs that something is wrong) combined with heart (knowing when to forgive and facilitate healing) and practical application (remedying the problem and setting healthy boundaries) to bring things in life back to balance and harmony. Sorry for the delay…I was out of the country and just returned yesterday. Yes, synchronicity does point me in new directions as well…it's pretty amazing at times!